We have been asked “how many ways are there to hide numbers (co-ordinates) on a geocaching listing page?” so we thought we would take a look at some of them. To start with we shall look at images. 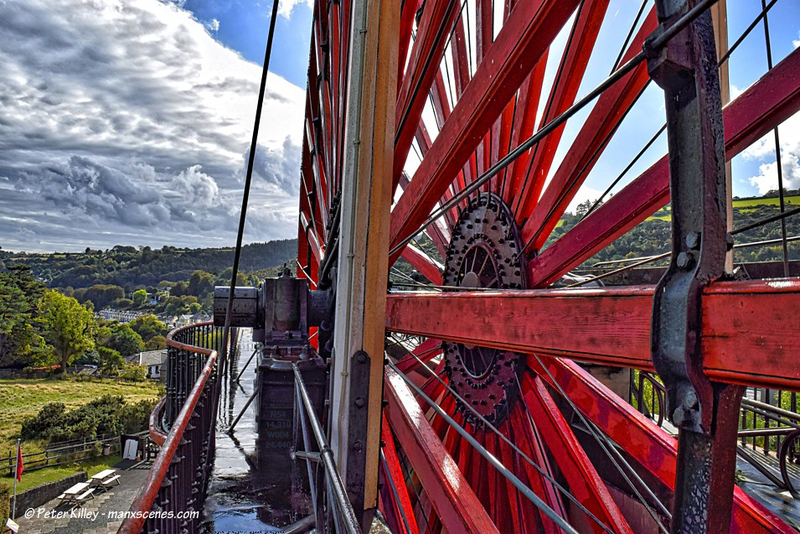 Here is a beautiful photograph taken by Peter Killey at manxscenes.com showing the Lady Isabella, the great Laxey Wheel. Again, if you zoom in you can see a pattern of black dots or pixels. They are 3 pixels high and 2 pixels wide which is the format of the Braille alphabet. If you use the Braille conversion page on Geocaching Toolbox you should be able to convert this to coordinates. The patterns could just as easily be a Hexahue , pig-pen or other pattern cipher. Not only can coordinates be hidden in the picture as described above but they can be added to the caption but, by using a font colour that is the same as the background, they appear ‘invisble’. Scroll back up the page and use your mouse to highlight the text line of the caption. You will see the coordinates appear as white text. This technique can be used not only on the caption line but anywhere on a webpage. Modern smartphones and many digital cameras can be set to embed coordinates in each photo they take. The coordinates are stored as “metadata” embedded in the photo files themselves. 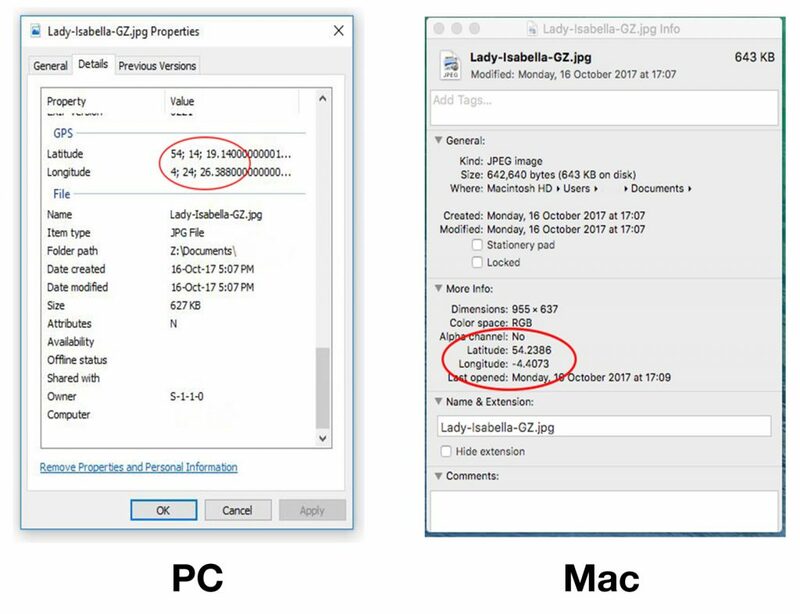 If you have the image downloaded on your PC or Mac you can easily view this metadata: In Windows right-click a picture file, select “Properties,” and then click the “Details” tab in the properties window. Look for the latitude and longitude coordinates under GPS. In macOS, right-click the image file (or Ctrl+click it), and select “Get Info.” You’ll see the latitude and longitude coordinates under the “More Info” section. You can try this now, just right-click on the image with the caption “Lady Isabella”. Select “Save image as…” and save it to your computer. Then view the ‘details’ as described above. If you are using a Smartphone there are many apps that can show you the coordinates of a ‘geotagged’ image but you can also upload the image to a website, such as https://www.geoimgr.com , which will read the coordinates online without any 3rd. party app. But you don’t actually have to download an image to read the Metadata. All web pages and also images contained in them have a unique ‘address’ on the internet. It is termed a ‘url’ or ‘Universal Resource Locator’. If you know the ‘url’ of a webpage you can type it into the address bar at the top of the web browser window. Take a moment to find the ‘url’ for this page. Find the address bar which starts manxgeocaching.com or https://manxgeocaching.com. If you ‘right-click’ on the image of the Lady Isabella, at the top of this page, depending on which web browser you are using, you will see an option to “Open image in new tab’ or similar. When you view the image in the new tab you can see the ‘url’ in the address bar. Highlight this and copy to your clipboard (Ctrl-C). If you use Microsoft Edge you may have to ‘Ask Cortana’ for help and ‘she’ will offer you an option to ‘See full-size image’. Click on that link and a new tab will open with the image ‘url’ in the address bar. You may have noticed that the formats of the latitude and longitude are different depending on which method you are using to view them. The preferred notation for geocaching is DD MM.MMM – degrees and minutes to three decimal places. Other formats used are DD.DDDD and DD MM SS.S Degrees, Minutes and Seconds. If you need to, converting these formats to DD MM.MMM is easy using the Geocaching Toolbox converter. 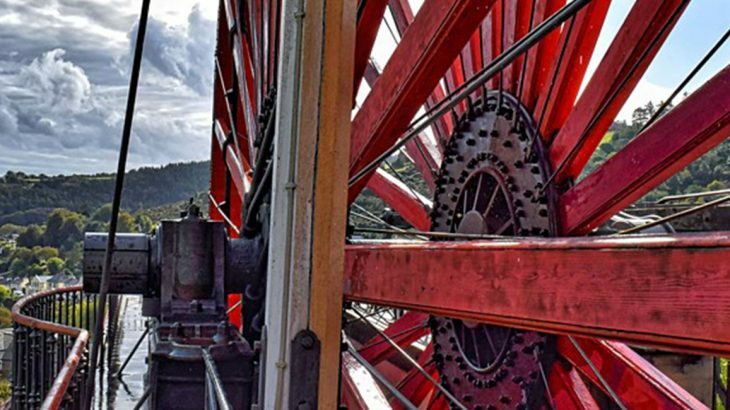 Now strap yourself in as it’s going to get even more ‘techy’! 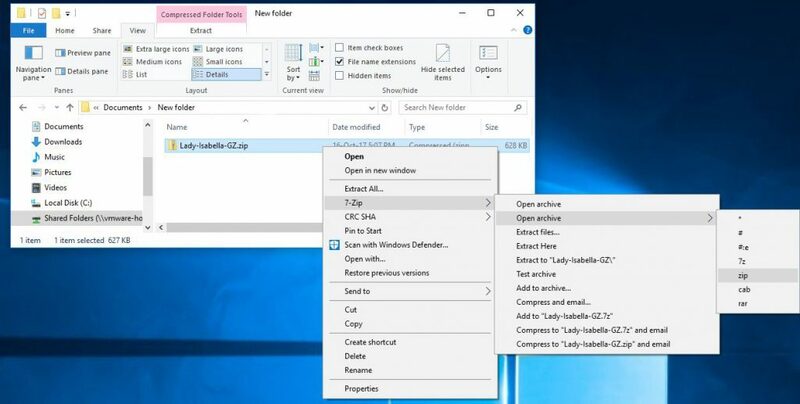 There is another way to hide information inside an image file but to it requires you to download the image to your computer and install some 3rd party software. Inside the image file there may be another hidden file which you need to extract with an ‘Unarchiver’ tool. For the PC you can use utilities like WinZip or WinRAR or , as we prefer, the free tool, 7-Zip. For the Mac you can use the free tool iZip Unarchiver. 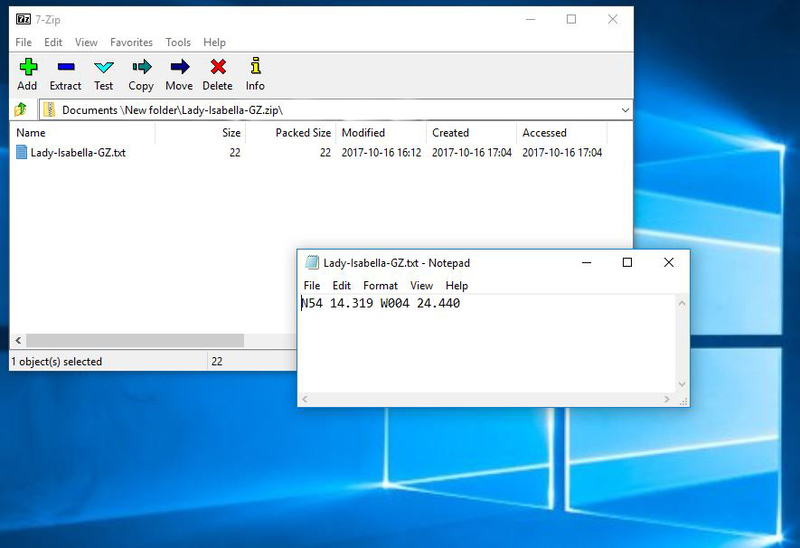 As an example we will use a PC with the Unarchiver 7-Zip installed and the image file ‘Lady-Isabella-GZ.jpg’. When you have downloaded the file you need to rename the .jpg part of it . This part is called the file ‘extension’ and is not normally visible by default. You have to tick the box marked ‘File name extensions’ in the File Manager window to be able to see it. Once you can see the file extension .jpg you should rename it .zip i.e. ‘Lady-Isabella-GZ.jpg’ becomes ‘Lady-Isabella-GZ.zip’. All that is then required is to right-click on the file name and select the options 7-Zip > Open archive > zip (as shown below). And, hey-presto, it will open a window and show you the hidden file in this case Lady-Isabella-GZ.txt (a text file). Double click on this file and it will open in Notepad for you to read the contents. Techniques like this can be used to hide files inside other files whether they be images, music or video. There are many more ways to hide information within pictures, such as using the details of the colour palette. The most common is the RGB system where each value lists the amount of red, green or blue that makes up a particular colour. Each colour is made up of varying amounts of red, green and blue. The scale used goes from 0 to 255 or in Hexadecimal 00 to FF. The above table illustrates how these are represented. If you see two colours, maybe as a border or a background to the image, similar to the example below, you should check on the mix of RGB. In this case the latitude and longitude of the Tower of Refuge, on St Mary’s Isle, is N54 09.022 W004 28.121 and the colour of the inner, almost brown, border is (RGB) 54,9,22 (Hexadecimal #360916) whilst the outer blue border is (RGB) 4,28,121 (Hexadecimal #041c79). You would need to examine the source code or even the image to see the colour information. To view the source code you need to right-click on the image and take the menu option to either “View Source” or “Inspect”. This will bring up a new window and show you the source code of the page. Here you will be able to see if any colour information is available, such as in this case the borders of a table containing the image. We think we have covered more than enough for now, so when you see an image on a Mystery or Unknown geocache page you might want to check it out as it may hold the clues for finding the cache.